Edwards curves have efficient scalar multiplication algorithms, and their application to pairing-based cryptography has been studied. In particular, if a pairing-friendly curve used in a pairing-based protocol is isomorphic to an Edwards curve, all the scalar multiplication appearing in the protocol can be computed efficiently. In this paper, we extend this idea to pairing-friendly curves not isomorphic but isogenous to Edwards curves, and add to pairing-friendly curves to which Edwards curves can be applied. Above all, pairing-friendly curves with smaller ρ-values provide more efficient pairing computation. Therefore, we investigate whether pairing-friendly curves with the minimal ρ-values are isogenous to Edwards curves for embedding degree up to 50. 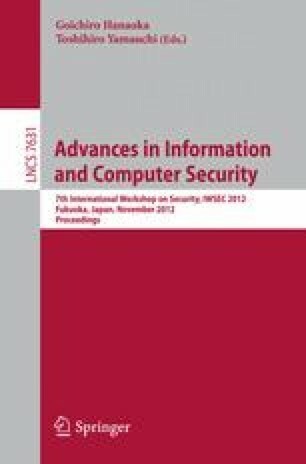 Based on the investigation, we present parameters of pairing-friendly curves with 160-bit and 256-bit security level at embedding degree 16 and 24, respectively. These curves have the minimal ρ-values and are not isomorphic but isogenous to Edwards curves, and thus our proposed method is effective for these curves.